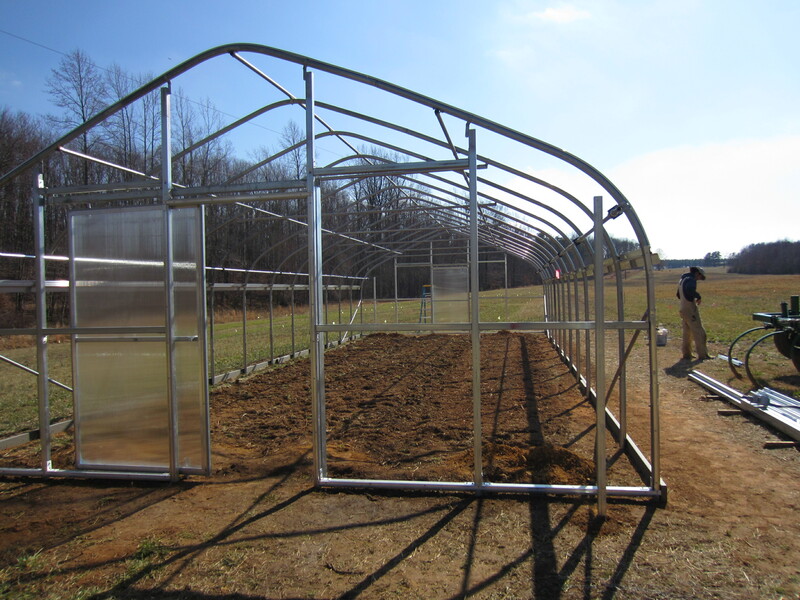 We are pretty excited because the high tunnel project is (almost) finished. Just a little plumbing and electrical work to add on later. 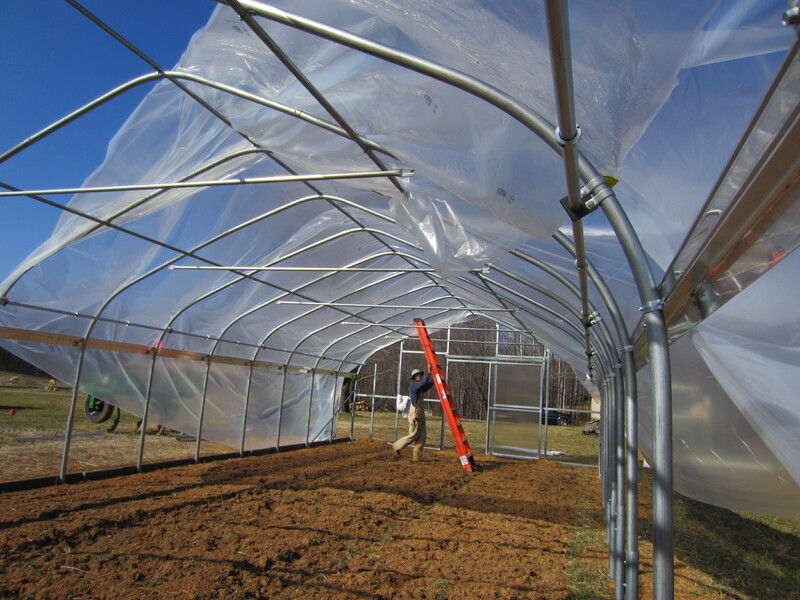 Every time we put plastic on a greenhouse we reconsider whether or not we really need structures to grow in. The answer is always yes: but it is definitely a real challenge getting the first layer of plastic on. Especially when there is the least little bit of wind and there are only two people to hold the plastic. Somehow we managed. The second layer of plastic is easy to slide over the first layer. Next Gavin put the plastic on the end walls. Then he attached one of the roll-down side-wall curtains. Unfortunately it was only halfway completed that day and so the plastic was left flapping around in the severe winds we had over the past week, until Gavin could get back to the project. Even weighting down the curtain with boards, buckets full of water, and extra metal tubing couldn’t hold back the forceful winds. It was unnerving to hear the loud ‘thwacks’ as the plastic caught the wind gusts and snapped against the structure in the middle of the night… we can hear a lot through the thin walls of the yurt! There was very little damage luckily, and Gavin finally had time to finish attaching the curtain to the baseboard. Next we constructed a small heated chamber for transplants inside. Just in time because we have many little seedlings that are busting out of their tiny soil blocks and ready for more growing space. 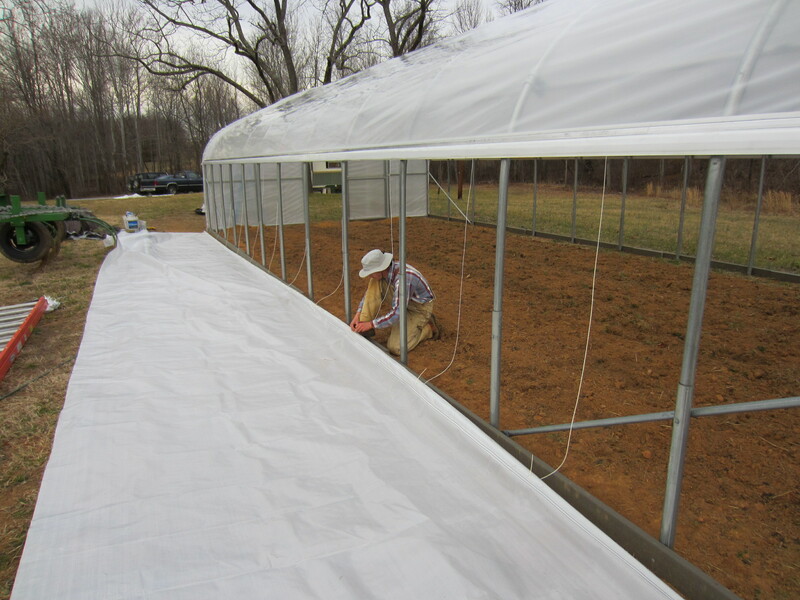 This is a temporary solution to our need for heated greenhouse space. Maybe our heated potting house will be ready in time for next spring. But this should work for this year. 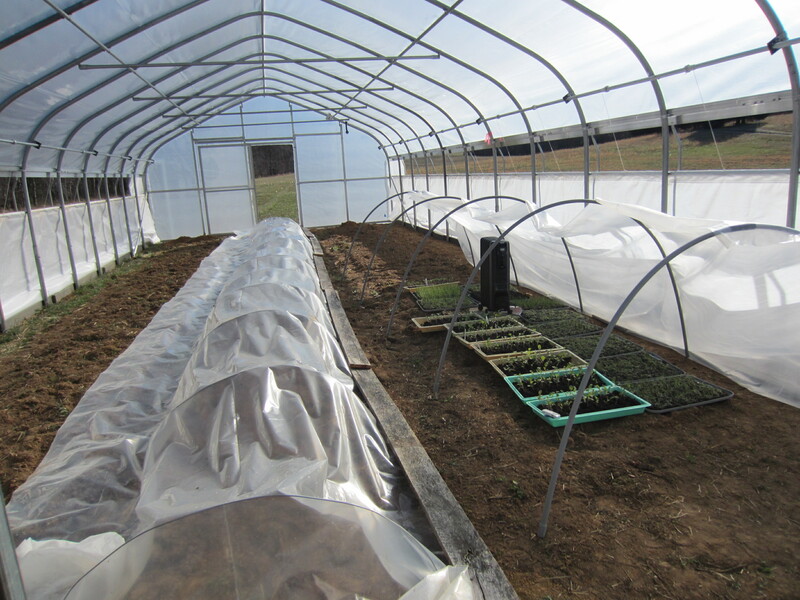 We also made a little cold tunnel for the cool-season crops to harden off in. 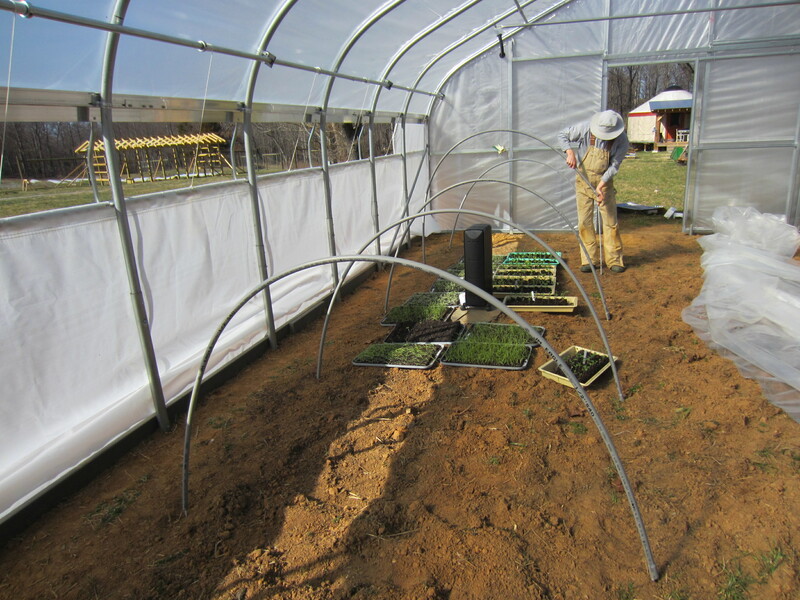 So our new tunnel will be full until the seedlings are evicted in a couple of weeks and we plant the tomatoes and peppers in here! 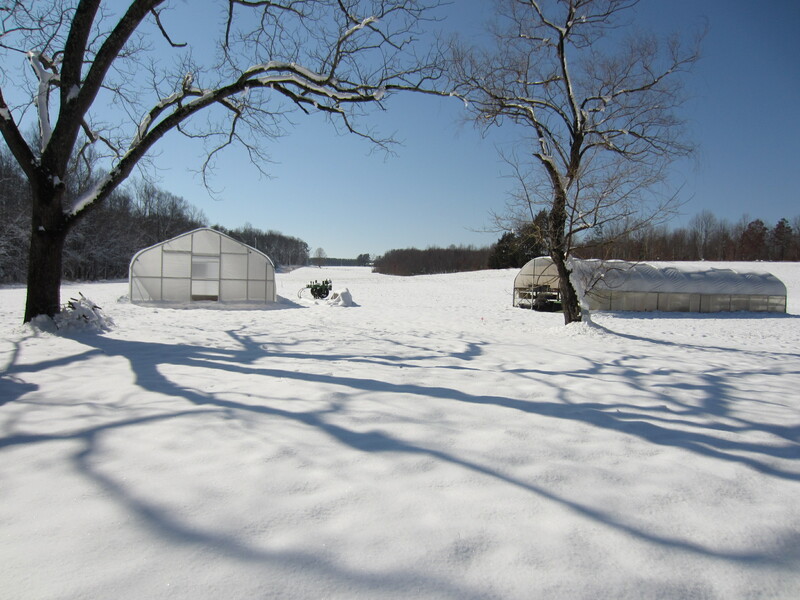 We got 5″ of snow early last week, which beautifully transformed the farm. We enjoyed the snow day, especially since we did not have to leave to go to work. It was the first, and hopefully last, snow of the season. 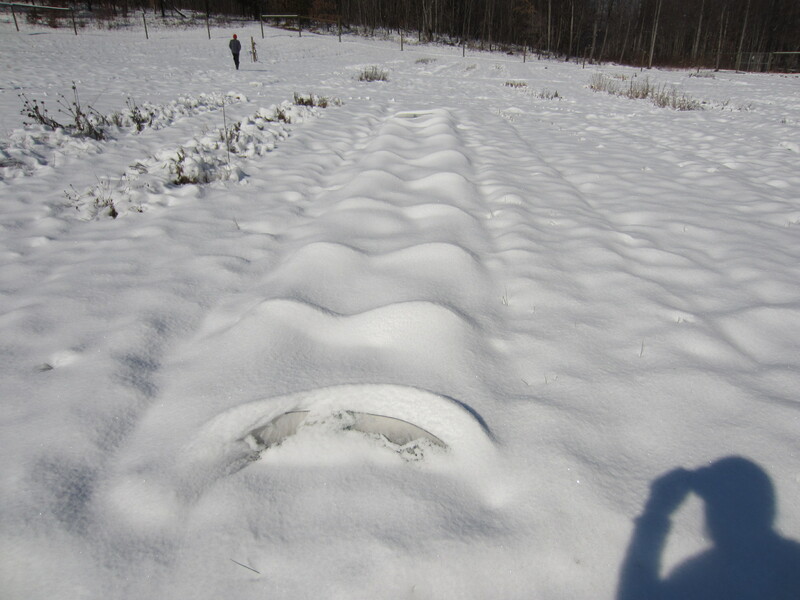 The weight of the snow crushed the wire hoops which are holding row cover over several over-wintered crops in the field. It is not a big deal to bend them back into shape, luckily. In colder areas of the country farmers use more substantial materials for their caterpillar hoops. 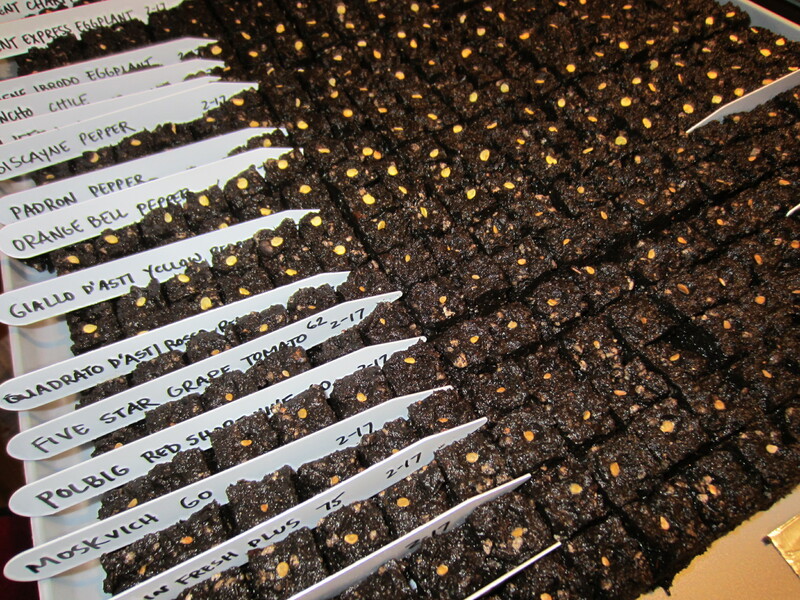 Many different varieties of tomatoes, peppers, and eggplant are germinating! Although it doesn’t look like much in this picture, I planted 119 bare-root blueberries in rows inside the fence a couple of weeks ago. Seven different varieties! Mostly rabbiteye and a few southern highbush. Next we will put down irrigation lines and mulch them. Friday was my last day working my off-farm job: I resigned. After seven years of delivering the mail through rain, snow, and all the rest, I will now be tending crops in the field through rain, snow, and all the rest. I am extremely excited to make the shift to full-time farmer!!! 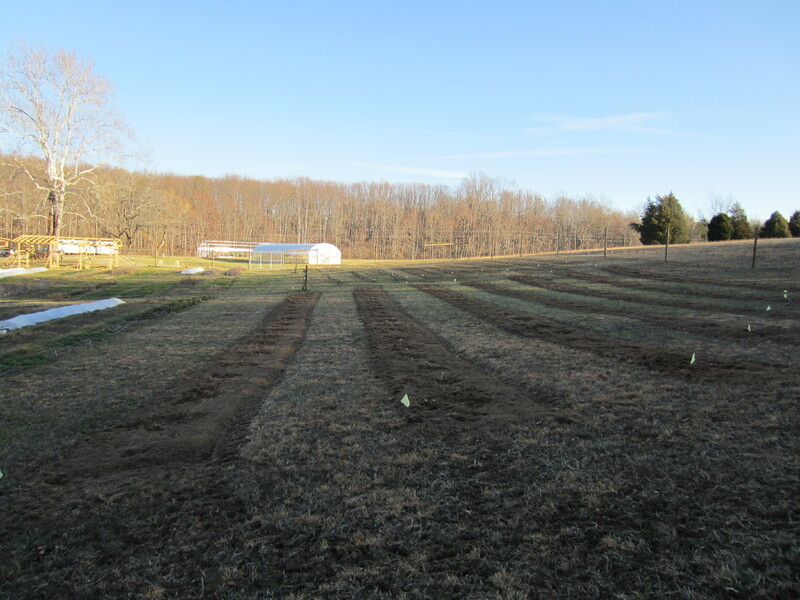 Now we will have someone here every day to manage the watering, planting, and harvesting tasks, and will not be scrambling to get the work done on evenings and weekends. Not that we will not be working evenings and weekends, but we are hoping the pace will be a little more enjoyable. We are looking forward to an exciting year. We are expanding our markets to include a Wednesday farm-share program and will be attending the Forest Farmers’ Market again. The markets don’t start until the end of April/beginning of May, but we are very busy already! Peas and spinach are in the ground!!! 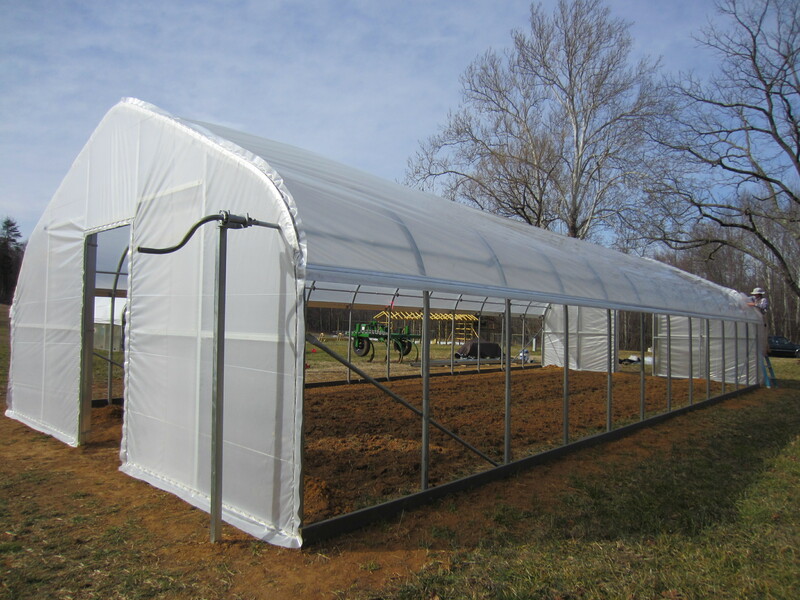 The new greenhouse looks great! You are really making progress. I’m sure you are working just as hard on the farm as you did on “the job”.